Sometimes plans take a turn for the worse but still can make you smile. My husband Doug and I took a day-trip to one of our favorite places, Shepherdstown, West Virginia. It’s a small town with a university flavor, a coffee bar that serves you sounds of jazz with your latte, a New Age gift shop and even a steamboat museum. We love to go there because in the course of a few hours, we can have a nice lunch, tool around the town, and wind up the afternoon walking along the C&O Canal next to the Potomac River. But as they say, if you want to make God laugh, tell her you’ve got a plan. In our case, it happened as soon as we turned the corner onto German Street to begin our quiet half-day visit. Instead of a sleepy town in the middle of summer, Doug and I suddenly found ourselves a block away from a crowded arts and craft festival. My husband does not like swarms of people or loud noises. He looked at me with unspoken words written all over his face. And they were not repeatable ones. As for me, I found my thoughts gravitating to words by Robert Burns – the paraphrased version – that “the best laid schemes of mice and men often go awry.” I wisely kept these to myself. We spent the next ten minutes searching for parking, then as music blared around us, Doug and I weaved our way through the throng. Trying to salvage our getaway, we lunched at our favorite restaurant mercifully located at the far end of town. After a leisurely meal, we decided to take a walk through the back streets, but we had to pass through the arts fest to get there. That is when I saw it: a table with a collection of beautifully made pottery. One in particular caught my eye. 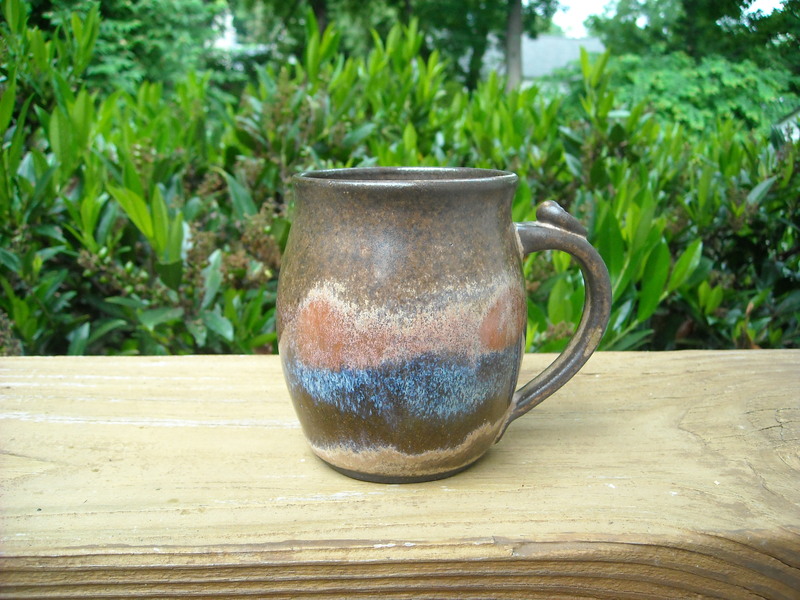 It was a lovely mug with swirls like oil puddles of blue, dusty rose and brown. The mug cost $12. A steal. So I bought it. The craftsman wrapped it in newspaper and put it in a brown paper lunch bag. We dropped off the mug in our car then took off on foot to explore the many restored wooden frame homes. As we walked along admiring their back yard gardens bursting with colorful flowers, I suddenly tripped and felt a sharp pain in my right big toe. I had tripped over an uneven crack in the sidewalk. Looking down I saw blood streaming from my sandal. I sat down on the steps leading up to the nearest home while Doug knocked on the door for help. A woman answered. She was just moving in but somehow quickly found a bottle of peroxide and some paper towels for me to use to stop the bleeding. A man passing through on his motorcycle saw our dilemma and suggested Doug go back to the festival where there was bound to be a first aid booth. I sent Doug quickly on his way and spent the next fifteen minutes sitting on hard cement steps while batting pesky gnats that were taking turns nosedive-bombing me. Beads of sweat trickled down my forehead. The moist, summer air was growing more humid by the minute. A police cruiser slowly approached and stopped. Doug got out of the back seat with a somewhat sheepish look on his face. Immediately following him was a medic carrying a black bag. To add to the gravity of the moment, the law enforcement officer climbed out of the driver side. The EMT came over and knelt down at my foot. Now it was my turn to look embarrassed. The medic looked at me for a second then glanced at my foot. Visibly annoyed, he reached into his black medical bag. Taking out a cotton ball, an alcohol wipe and tube of antibiotic ointment, he dabbed the cut with the antiseptic, smeared on some medicated cream, and grabbed something out of his bag one last time. Without saying a word – although I swear there was steam coming out of his ears – he undid what seemed to me to be the smallest band aid in the world. He wrapped it around my big toe. “That should do it,” he said, without even handing me a backup bandage for my flesh wound. He and the policeman then walked back to their motor vehicle. I noticed the car pulled away much faster than when it arrived. I looked up at my husband. “I told them you injured your foot and couldn’t walk,” Doug said, still sheepish about their overreaction. At this point, I did not think a discussion of word choice was in order. My husband walked and I hobbled back to the car. We headed out of town and stopped at the C&O towpath in hopes I could fit my foot into the running shoes I had brought along. This way we could at least walk far enough to see the river. But the pressure from the top of my footgear was too hard on my injured toe. We had to turn around after going only a very short distance. As we headed home, we were both silent for a few long minutes, disappointed that our day had not at all turned out the way we expected. Then I looked at the brown package I had placed on the floor. I reached down and picked it up. Placing it on my lap, I unrolled the newspaper and lifted the lovely cup to the window, admiring the earthy colors and its smooth sheen from capturing the outdoor light. I glanced at Doug. He looked over at me with an understanding smile. Putting my prized possession back in the paper sack, I thought of my husband racing through the crowded festival looking for the first aid tent. I turned to him and pecked him on the cheek. Then I smiled, too. My best treasure was sitting right beside me. Paula Cruickshank, a former White House correspondent for 34 years, is earning an MA in Writing at Johns Hopkins University. She and her husband, Doug, enjoy drinking hot beverages in earthenware mugs. They reside in Arlington, Virginia. Awww – sweet! I’ll bet the EMT guy would have written a different story!